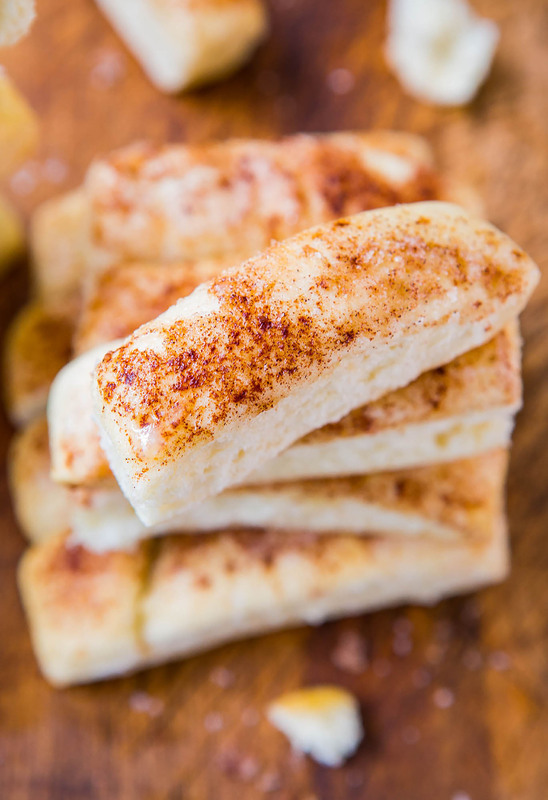 Warm and fresh from the oven, these vegan buttery breadsticks are ridiculously good. They're soft, fluffy, tender, and make your house smell amazing while baking. There's only one hour that separates you from warm, fresh, homemade bread. To the bowl of a stand mixer fitted with the dough hook (or large mixing bowl and hand-knead), combine flour, water, yeast, oil, sugar, optional salt, and knead for about 7 minutes, or until dough is soft, smooth, and has come together in a firm mass. If hand-kneading, you may need to knead a few minutes longer. Turn dough out onto a silicone-lined or greased standard-sized baking sheet. Using a rolling pin, roll dough into a rectangle that's approximately 8x12-inches, and about 1-inch thick. No need to measure, just eyeball it and roll into a rectangle that covers about two-thirds of a standard baking sheet. Score the dough with a pizza cutter. One long slice down the middle, and then 11 vertical slices, creating 22 breadsticks. Depending on the size and shape of your dough, and your size preference for breadsticks, you may get more or less breadsticks. Cover the pan with a piece of plastic wrap and place it in a warm, draft-free place to rise, about 30 minutes. Before baking, generously brush dough with about half of the melted butter (or a vegan buttery spread); reserve remainder. Bake for about 20 minutes, or until slightly golden, firm to the touch, and cooked through. After baking, drizzle with remaining melted butter. Breadsticks are best warm and fresh, but will keep airtight for up to 2 days. Before eating leftovers, heat for 5 seconds in microwave to soften them up, adding a pat of butter if desired.